Phenology (seasonal life cycle changes of plants and animals) is one of the most sensitive indicators of global climate change, and one of the few ways that people of all ages can understand how global-scale changes are affecting plants, animals, and people locally. In fact, the 2007 Intergovernmental Panel on Climate Change noted that ‘Phenology is perhaps the simplest process in which to track changes in the ecology of species in response to climate change.’ Many organisms, including humans, depend on the timing of seasonal changes, and they are integral to our day-to-day lives. For example, songbirds migrate north in spring just as the insects they eat are emerging. Scientists, naturalists, farmers, gardeners, fishermen, and many others have been recording their observations of seasonal changes for centuries. By comparing historical observations with more recent ones, climate scientists have identified shifts in long-term phenological trends that closely match records of Earth’s warming temperature. 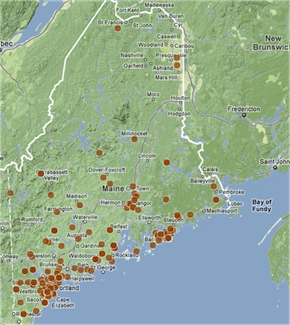 Climate-related changes in phenology will likely disrupt interactions within ecosystems, and between humans and natural systems, so scientists and resource managers in Maine and across the country need reliable phenology records to make decisions about all kinds of issues. These include species and habitat management, public health, hunting, fishing, recreation, and agriculture. The only way these data can be collected in large enough numbers, and over a large enough area is by involving volunteers in citizen science. 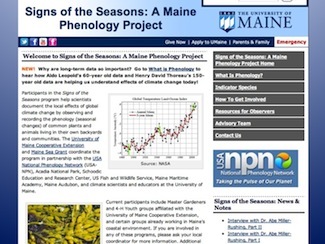 With dual goals of increasing climate literacy among Maine citizens and helping climate scientists gather critical phenology data, the University of Maine Cooperative Extension and Maine Sea Grant launched a citizen science monitoring program called Signs of the Seasons: A Maine Phenology Program (SOS) in 2010, with the support of numerous partners. The program engages citizens of all ages in observing and recording phenology in their own backyards and communities. Signs of the Seasons volunteers help scientists, resource managers, and others document, understand, and predict changes that affect Maine’s environment, economy, and cultural heritage. SOS spans the terrestrial and marine environments. 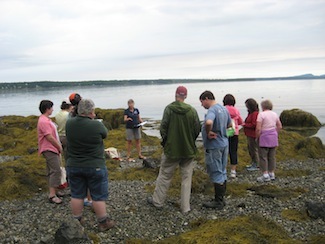 Training of volunteers to observe phenophases, measure water quality parameters; age and measure growth rate of Rockweed along the Maine coast. For the rockweed species of interest, Ascophyllum nodosum, reproduction is temperature dependent. Resources, articles and interviews on research, connection to climate change and education as well as a link to the online Nature’s Notebook database of the USA National Phenology Network, with which we are a close partner. UMaine Extension/Sea Grant coordinate the program in partnership with USA-NPN, Acadia National Park, Schoodic Education and Research Center, US Fish and Wildlife Service, Maine Maritime Academy, Maine Audubon, and climate scientists and educators at the University of Maine.